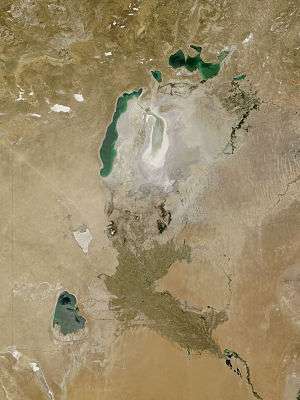 Khwarezm /kwəˈrɛzəm/ or Chorasmia /kəˈræzmiə/ (Persian: خوارزم‎‎, Xvârazm) is a large oasis region on the Amu Darya river delta in western Central Asia, bordered on the north by the (former) Aral Sea, on the east by the Kyzylkum desert, on the south by the Karakum desert, and on the west by the Ustyurt Plateau. It was the center of the Iranian Khwarezmian civilization and a series of kingdoms such as the Persian Empire, whose capitals were (among others) Kath, Gurganj (the modern Köneürgenç) and – from the 16th century on – Khiva. 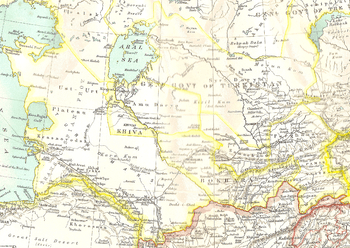 Today Khwarezm belongs partly to Uzbekistan, partly to Kazakhstan and partly to Turkmenistan. Khwarezm has been known also as Chorasmia, Khwarezmia, Khwarizm, Khwarazm, Khorezm, Khoresm, Khorasam, Kharazm, Harezm, Horezm, and Chorezm. In Avestan the name is Xvairizem; in Old Persian Huwarazmish; in Modern Persian خوارزم Xvārazm; in Arabic خوارزم Xuwārizm; in Old Chinese *qʰaljɯʔmriɡ (呼似密); in modern Chinese Huālázǐmó (花剌子模 / Xiao'erjing: خٗوَلاذِموْ); in Tajik Хоразм, Xorazm, خارَزم; in Kazakh Хорезм (Xorezm), حورەزم; in Uzbek Xorazm, Хоразм, خورەزم; in Turkmen Horezm, Хорезм, خوْرِزم; in Turkish Harezm; in Greek language Χορασμία (Chorasmía) and Χορασίμα (Chorasíma) by Herodotus. 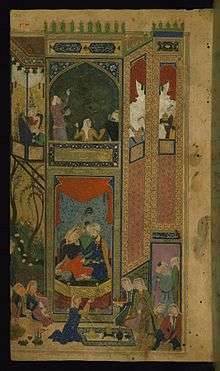 Some of the early scholars believed Khwarezm to be what ancient Avestic texts refer to as Airyanem Vaejah (Ariyaneh Waeje; later Middle Persian Iran vij). These sources claim that Old Urgench, which was the capital of ancient Khwarezm for many years, was actually Ourva, the eighth land of Ahura Mazda mentioned in the Pahlavi text of Vendidad. However, Michael Witzel, a researcher in early Indo-European history, believes that Airyanem Vaejah was located in what is now Afghanistan, the northern areas of which were a part of ancient Khwarezm and Greater Khorasan. Others, however, disagree. University of Hawaii historian Elton L. Daniel believes Khwarezm to be the "most likely locale" corresponding to the original home of the Avestan people, and Dehkhoda calls Khwarezm "the cradle of the Aryan tribe" (مهد قوم آریا). 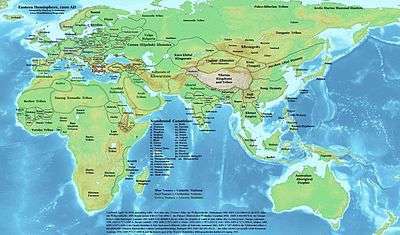 Al-Biruni (973-1048), a native speaker of Chorasmian (an Iranian language), says that the land belonging to the mythical king Afrasiab was first colonised 980 years before Alexander the Great (thus ca. 1292 B.C., well before the Seleucid era) when the hero of the Iranian epic Siyavash came to Khwarezm; his son Kay Khusraw came to the throne 92 years later, in 1200 B.C. Al-Biruni starts giving names only with the Afrighid line of Khwarazmshahs, having placed the ascension of Afrighids in 616 of the Seleucid era, i.e. in 305 A.D.
An East Iranian language, known as Khwarezmian language, was spoken in Khwarezm proper (i.e., the lower Amu Darya region) until soon after the Mongol invasion, when it was replaced by Turkic languages. It was closely related to Sogdian. Other than the astronomical terms used by the native Iranian Chorasmian speaker Al-Biruni, our other sources of Khwarezmian include Zamakhshari's Arabic-Persian–Khwarezmian dictionary and several legal texts that use Khwarezmian terms to explain certain legal concepts. The area of Khwarezm was under Afrighid and then Samanid control until the 10th century before it was conquered by the Ghaznavids. The Iranian Chorasmian language and culture felt the pressure of Turkic infiltration from northern Khwarezm southwards, leading to the disappearance of the original Iranian character of the province and its complete Turkicisation today, but Khwarezmian speech probably lasted in upper Khwarezm, the region round Hazarasp, till the end of the 8th/14th century. The Iranian Chorasmian language survived for several centuries after Islam until the Turkification of the region, and so must some at least of the culture and lore of ancient Khwarezm, for it is hard to see the commanding figure of Al-Biruni, a repository of so much knowledge, appearing in a cultural vacuum. 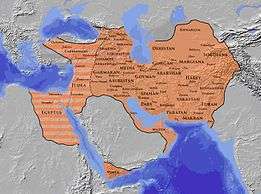 Although largely independent during the Seleucid, Bactrian and Arsacid dynasties, it is known that Khwarezm and neighboring Bactriana were part of the Sassanid empire during the time of Bahram II. Yaqut al-Hamawi verifies that Khwarezm was a regional capital of the Sassanid empire. When speaking of the pre-Islamic "khosrau of Khwarezm" (خسرو خوارزم), the Islamic "amir of Khwarezm" (امیر خوارزم), or even the Khwarezmid Empire, sources such as Al-Biruni and Ibn Khordadbeh and others clearly refer to Khwarezm as being part of the Iranian (Persian) empire. The fact that Pahlavi script which was used by the Persian bureaucracy alongside Old Persian, passed into use in Khwarezmia where it served as the first local alphabet about the AD 2nd century, as well as evidence that Khwarezm-Shahs such as ʿAlā al-Dīn Tekish (1172–1200) issued all their orders (both administrative and public) in Persian language, corroborates Al-Biruni's claims. It was also vassal kingdom during periods of Kushans, Hephthalites and Gokturks before coming of Arabs. In the 12th century, the Khwarezmid Empire was founded and, in the early 13th century, ruled over all of Persia under the Shah ʿAlāʾ al-Dīn Muhammad II (1200–1220). In 1141, Yelü Dashi won the battle of Qatwan against a Seljuk army commanded by Sanjar, as a result, Khwarezm became a vassal of the Kara-Khitan Khanate. Then from 1218 to 1220 Genghis Khan launched the invasion of Central Asia which absorbed the Kara-Khitan Khanate, and ended Khwarezmid Empire. Sultan Muhammad died after retreating from the Mongols near the Caspian Sea, while his son Jalal ad-Din, after defeat by Genghis Khan at the Battle of Indus sought refuge with the Delhi Sultanate, and was later assassinated after various attempts to fight both the Mongols and the Seljuks. The region of Khwarezm was split between the White Horde and Jagatai Khanate, and its rebuilt capital Gurganj (by now known as "Urganch") again became one of the largest and most important trading centers in Central Asia. In the mid-14th century Khwarezm gained independence from the Golden Horde under the Sufid dynasty. However, Timur regarded Khwarezm as a rival to Samarkand, and over the course of 5 campaigns, he destroyed Urganch completely in 1388. This together with a shift in the course of the Amu-Darya caused the center of Khwarezm to shift to Khiva, which became in the 16th century the capital of the Khanate of Khiva, ruled over by the dynasty of the Arabshahids. The discovery of gold on the banks of the Amu Darya during the reign of Russia's Peter the Great, together with the desire of the Russian Empire to open a trade route to the Indus (modern day Pakistan), prompted an armed trade expedition to the region, led by Prince Alexander Bekovich-Cherkassky, which was repelled by Khiva. Today, the area that was Khwarezm has a mixed population of Uzbeks, Karakalpaks, Turkmens, Persians, Tatars, and Kazakhs. ↑ L. Massignon, "Al-Biruni et la valuer internationale de la science arabe" in Al-Biruni Commemoration Volume (Calcutta, 1951), pp. 217–219. excerpt: In a celebrated preface to the Book of Drugs, Biruni says: "It is through the Arabic language that the sciences have been transmitted by means of translations from all parts of the world. They have been enhanced by the translation into the Arabic language and have as a result insinuated themselves into men's hearts, and the beauty of this language has commingled with these sciences in our veins and arteries. And if it is true that in all nations one likes to adorn oneself by using the language to which one has remained loyal, having become accustomed to using it with friends and companions according to need, I must judge for myself that in my native Chorasmian, science has as much as chance of becoming perpetuated as a camel has of facing Kaaba." ↑ Encyclopædia Iranica, "CENTRAL ASIA: The Islamic period up to the mongols", C. Edmund Bosworth: "In early Islamic times Persians tended to identify all the lands to the northeast of Khorasan and lying beyond the Oxus with the region of Turan, which in the Shahnama of Ferdowsi is regarded as the land allotted to Fereydun's son Tur. The denizens of Turan were held to include the Turks, in the first four centuries of Islam essentially those nomadizing beyond the Jaxartes, and behind them the Chinese (see Kowalski; Minorsky, "Turan"). Turan thus became both an ethnic and a geographical term, but always containing ambiguities and contradictions, arising from the fact that all through Islamic times the lands immediately beyond the Oxus and along its lower reaches were the homes not of Turks but of Iranian peoples, such as the Sogdians and Khwarezmians." ↑ C.E. Bosworth, "The Appearance of the Arabs in Central Asia under the Umayyads and the establishment of Islam", in History of Civilizations of Central Asia, Vol. IV: The Age of Achievement: AD 750 to the End of the Fifteenth Century, Part One: The Historical, Social and Economic Setting, edited by M. S. Asimov and C. E. Bosworth. Multiple History Series. Paris: UNESCO Publishing, 1998. excerpt from page 23: "Central Asia in the early seventh century, was ethnically, still largely an Iranian land whose people used various Middle Iranian languages. 1 2 3 Clifford Edmund Bosworth, The New Islamic Dynasties: A Chronological and Genealogical Manual, Columbia University, 1996. West, Barbara A. (January 1, 2009). Encyclopedia of the Peoples of Asia and Oceania. Infobase Publishing. ISBN 1438119135. Retrieved March 13, 2015.